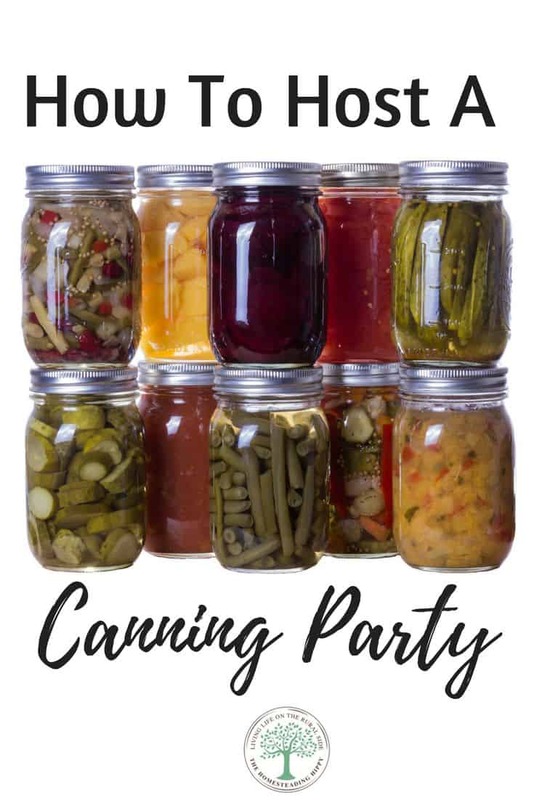 Get your canning on in a FUN way by hosting a canning party! Get a group of friends together and share the work. Learn how to get a canning group started. Getting your garden produce can sometimes be a chore. There’s food to clean, chop and prepare, jars to wash, canners to fill with water and processing time to get down. Hosting a canning party can make this a fun time for all. Why host a canning party? A canning party is great for beginners. 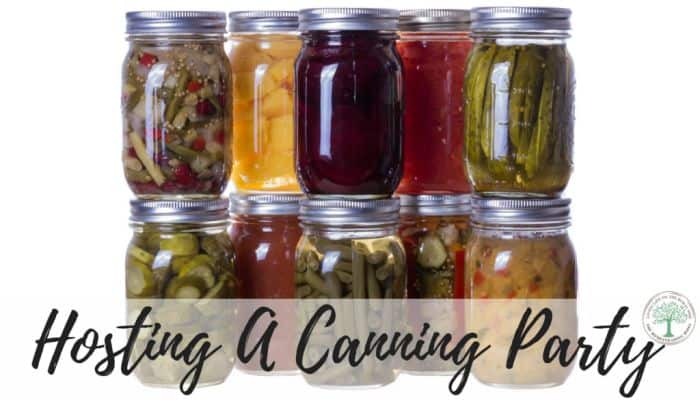 If you have friends who want to learn how to can, or you want to expand your skills in canning, learning side by side with someone more experienced is very helpful. A canning party can cut the amount of work you have to do. Doing 10 bushels of peaches by yourself can be daunting, but divide that work up by 10 women, and the work is done lickety-split! Hosting a home canning party means spending time with old friends, and getting to know new ones. You can work alongside someone new, and have something to “break the ice” over as well. Decide who to invite. Having BOTH experienced canners and beginner canners will make it fun for all. Invite five people you know and have each one bring a friend so you can meet new friends, too. Having a group of 10 people is usually the biggest canning party you will want unless you can rent a larger space. Decide on the items to be preserved. Make a list of ingredients that need to be brought. Who will bring the sugar, or pickling salt? Will everyone be responsible for bringing the same amount of tomatoes, or will some bring tomatoes and others pay for their share? Determine the location. Who’s got the biggest kitchen? Are they willing to share their kitchen for the day? Can you rent out a kitchen if need be? Our local park pavilion has a full kitchen that they allow people to rent for parties and such. Teach the new members. If you are inviting newbie canners to your group it might be helpful to teach them how to use a pressure canner before you begin. That will save time during processing day. Decide on recipes and what the group wants to can. Have people bring 2-3 of their favorite family favorites and share with the others there on the menu or 3 x 5 cards. Have people decide what jobs they want to do. Team up in teams of 2-3 for each “station”, and allow switching around during the day to allow each person to do each job. Have fun with this. At the end of the day, make sure everything is cleaned up and each one has their share of jars. Last bit of canning party advice: have everyone work together to help create dinner that night, too! Nothing worse than spending all day in the kitchen, only to have to cook dinner at home. Making quick meals as a group will help to alleviate that stress. Have you ever hosted a canning party? Are you ready to try it this year? Be sure to pin this for later, too! We typically wax the cheese.